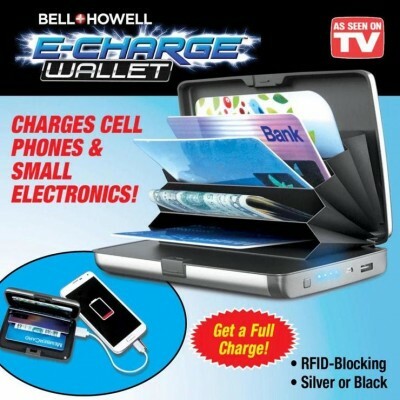 - Product Name: E-Charge Wallet - As Seen On Tv. 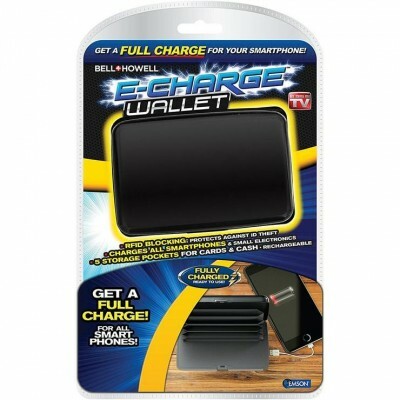 - Product Description: Get A Charge, It with the E-Charge Wallet Phone Charger by Bell and Howell. 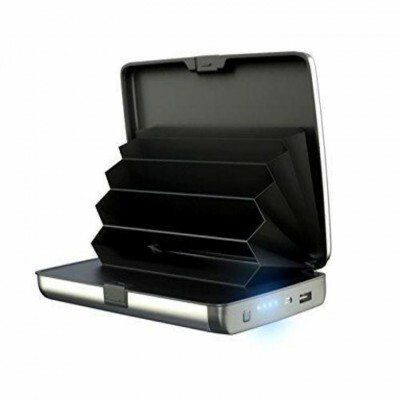 High Capacity Power Pack provides up to 2x your normal smart phone’s battery. The accordion design organizes and holds all your cards and cash. RFID Protection keeps your accounts safe from thieves and hackers. 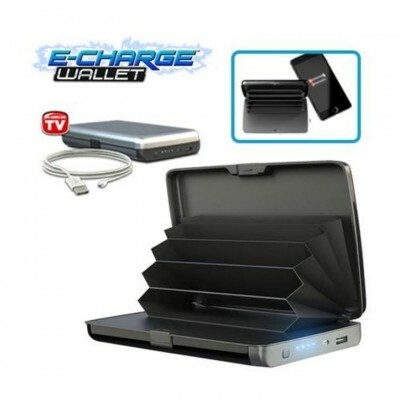 - Product Features: E-Charge Wallet Phone Charger - As Seen On TV. Works with all phones including - Samsung and iPhone. 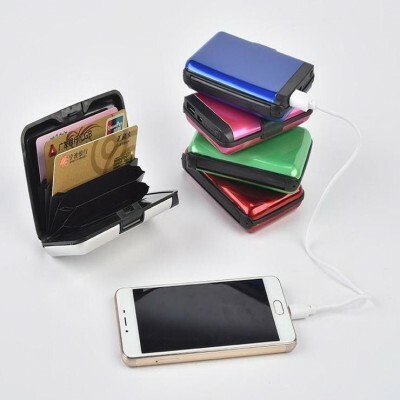 E-Charge wallet indicator light fully lights-when product is fully charged. Holds up to 2x normal smart phone’s battery. Accordion design organizes cards and cash. Weighs less than a normal leather wallet. Can withstand extreme heat and frigid cold. RFID Protection & Great for all forms of travel. 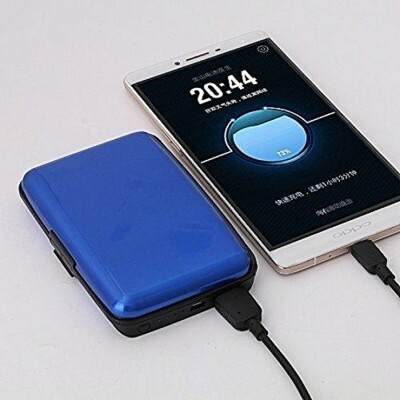 - Specification:- Power Bank Capacity: 2500mah - High-Quality Battery. Charge-time : 2 - 3 hours. 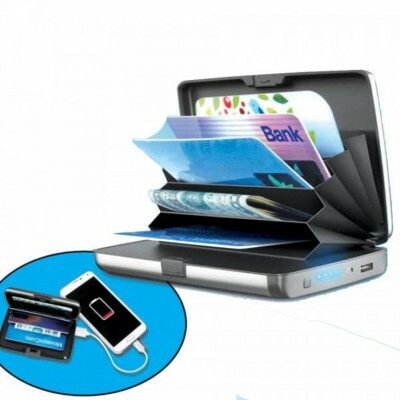 > Included: USB for charging, RFID-protected-E-Charge Wallet. 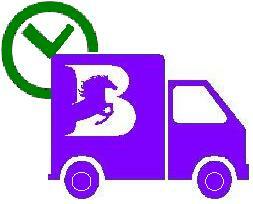 Size : 4.2 x 2.75 x 0.75 inch.